Bad Bad Men at The Brothers Lounge, Feb. 17, 2018. They play tonight at O’Leaver’s. For your typical indie music fan here in Omaha, last year’s Maha Music Festival was about as good as it gets. We’re talking some of the best indie acts available anywhere — among them, Father John Misty, Tune-Yards, TV on the Radio and Hop Along — topped off with a non-indie ’90s-era alternative band in Weezer. The sheer fact that Maha has survived for a decade is a tribute to organizers who poured their blood, sweat and dollars into a dream many thought wouldn’t survive its debut year. Last year’s 10-year anniversary show pushed the festival to two days, or at least one-and-a-half, with the addition of an evening program the day before the Saturday event. Plans call for repeating that format again for Year 11, slated for Aug. 16-17, as discount pre-sale tickets go on sale Friday for those willing to gamble that the acts announced Thursday, April 18, are worth it. I should be clear here — according to their Facebook page, early-bird 4-day passes go on sale Friday — i.e., these include admittance to the Big Omaha conference Aug. 14 and 15, which has been awkwardly welded onto Maha after the organization took ownership of Big Omaha last year. Maha has even rebranded itself this year as Maha Festival, which could confuse people outside of the area who stumble upon it for the first time (Hey, look, a 4-day music festival in Omaha. Waitaminit, the first two days are entrepreneur-focused TED-type talks not related to music? Uh, forget it.). Taking on Big Omaha must have seemed like a natural progression for Maha in their quest to expand the festival beyond music. But to some (i.e., me) it’s an odd fit that doesn’t really have anything to do with their original music-focused mission. But, oh well, right? It’s anyone’s guess who the festival has lined up for a headliner this year. Weezer may may have seemed outside of Maha’s original indie focus, but is in line with a change that began three years ago with Passion Pit followed by Run the Jewels, acts that aren’t exactly indie. Let’s face it, most music-goers don’t know what “indie” is, anyway. Maha clearly was trying to broaden its audience, and who can blame them? Indie is a microscopically small genre that appeals to a very narrow audience. That said, indie acts like Wilco, Arcade Fire, LCD Soundsystem, Tame Impala and Courtney Barnett — all of which would draw huge crowds — always seem out of their reach. My guesses for possible headliners and/or bill fillers? – Vampire Weekend, who have come through here before and have a new album. – Jenny Lewis, a local favorite, though she already has a gig booked in St. Louis Aug. 17. – Metric, also through here a lot. – Sharon Van Etten, another hot act. – Strand of Oaks, one of my personal faves, has a new album. – Karen O of Yeah Yeah Yeahs, not sure she’s touring. And no doubt we’ll see at least a couple vintage indie bands in the line-up this year. Maybe Stephen Malkmus of Pavement, perhaps return appearances by Bob Mould or Guided By Voices or Dinosaur Jr.? 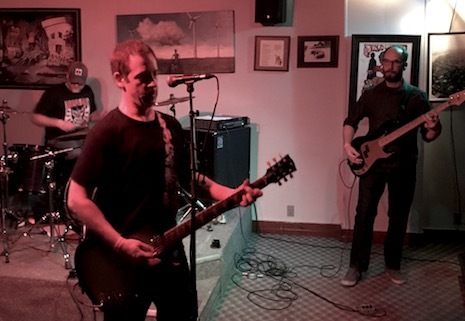 Bad Bad Men — a band consisting of uber-talented punk legends John Wolf, Jerry Hug and Chris Siebken — plays tonight at fabulous O’Leaver’s, opening for In the Whale and Natural States. 9 p.m. sharp, probably $5. Also tonight, mysterious pop-punkers Masked Intruder plays at Lookout Lounge with Four Arm Shiver and The Shidiots. $15, 8 p.m.
Caroline Rose at Reverb Lounge, June 7, 2018. The whole time I was watching Caroline Rose last night at Reverb Lounge I’m thinking, “Man, she looks just like Buddy from the ‘70s TV show Family.” I mentioned this to someone after the show who had no idea who I was talking about, hadn’t heard of Buddy or the show. When I said the star’s name was Kristy McNichol, the guy asked, “Wasn’t she one of Charlie’s Angels?” Right decade, wrong show. It doesn’t matter I guess as long as you catch the ‘70s reference, because Caroline Rose’s music sounds like something from that era. Not “Rock 100 FM ‘70s Classic Rock,” but sort of bubble-gum rock with some punk/new wave overhang sung in a voice that’s as cute as it is fetching in a Courtney Barnett sort of way. The set was dominated by songs off her current album, Loner (2018, New West) that are fun, sarcastic and witty with dark overtones peeping through the edges. 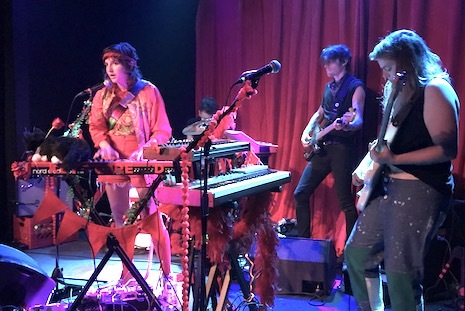 It’s an infectious album, and she performed the tunes with the goofy energy that they deserve, backed by keyboardist/guitarist and a tight rhythm section who looked like they were having as much fun as the audience. Rose’s between-song patter was almost as entertaining as her music, cracking wise and telling stories and introducing each number by saying, “This is my favorite song. No, this really is my favorite song.” I guess they all were. And to tell the truth, each song was its own little high point (though I especially loved hearing “Bikini” and “Money” and “Jeannie Becomes a Mom”). Cardioid at Reverb Lounge, June 7, 2018. 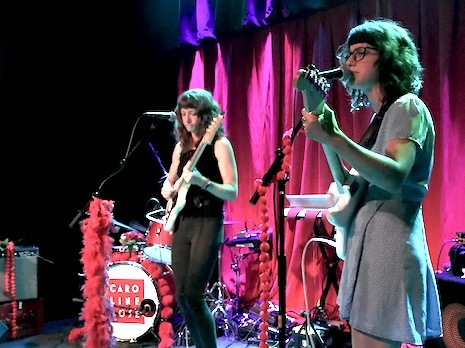 Opener, Portland band Cardioid, was a surprise. They started out sounding like your typical indie band in an Angel Olson sort of way, with a lead singer whose voice I couldn’t quite put my finger on. I was thinking Rosanne Cash, but another person pointed to Roy Orbison, which was much more on target. As the set progressed their style became almost proggy with unique, unorthodox arrangements, chord changes and great harmonies, you never knew where they were going next. Sublime. O’Leaver’s is hosting its a two-day Mid by Midwest mini festival that combines comedy and music. Tonight’s music, which starts at 10 p.m., features a rare performance by Jason Steady (Talking Mountain, Wolf Dealer). Joining him is Dorsia. Your $10 ticket gets you in for the two hours of comedy leading up to music, starting at 8 p.m.
On day 2 of Mid by Midwest (Saturday) Nik Freitas headlines the music with Miwi La Lupa kicking off the jams at 10 p.m. As I mentioned yesterday, Freitas’ new album, Day & Dark, is stunningly good. Like the prior night, your $10 cover gets you into the two-hour comedy show that leads up to the music. More info here. Let’s back up… Also happening Friday night is a rock show at Brothers Lounge featuring The Ramparts, Narco States and Bad Bad Men (Wolf/Siebken/Hug). $5, 9 p.m.
And Scott Severin (who’s celebrating a birthday today) opens for Jack Hotel tonight at The Harney Street Tavern. 9 p.m. and free. And lest I forget, City Councilman Pete Festersen and a band that includes guitarists Vic Padios and Mark Weber plays a show tonight at the Benson B-Side (next to the Benson Theater). The show is $5 and starts at 8. Come see how a politician plays the drums. Saturday night Okkervil River returns to Omaha, this time to The Waiting Room. Here’s a band that’s played just about every performance space in the city, from The Junction to O’Leaver’s to Slowdown. This was the last time I interviewed Will Sheff way back in 2005 when Black Sheep Boy was released, wherein he had this golden quote: “The fact is, it’s hard to spend seven months a year on the road making less money than a 7-11 clerk and still have a satisfying life.” That doesn’t seem to have stopped him. The band has a new record out called In the Rainbow Rain (2018, ATO). Sheff’s voice still has that same pretty, sad lilt heard on all their music. Star Rover opens at 8 p.m. $18 DOS. That’s all I got. If I missed your show, put it in the comments section. Have a great weekend. Bad Bad Men at The Brothers Lounge, Feb. 17, 2018. No matter what happens to the Blackstone District — no matter what new restaurant or bar or business opens its doors, no matter how gentrified it becomes — there will always be The Brothers Lounge. The Brothers has always been — is — and will always be an Omaha punk Mecca that remembers its past and welcomes its future with open arms. The Brothers is where you’ll find the best jukebox, the nicest staff and the coldest beer (though they quit selling Rolling Rock because, I was told, the last “regular” who ordered it died of a heart attack. I guess Trey either forgot that I drink Rolling Rock or I need to become a regular). I can’t imagine Omaha without The Brothers, and hopefully I’ll never have to. I write this because in an effort to keep up with all the new-fangled businesses (including yet another new bar that opened practically right under them) The Brothers has been beefing up its live music bookings lately. This past weekend featured back-to-back showcases Friday and Saturday night. I made it to Saturday night’s three-band bill, figuring I’d miss the opening act (hey, Black Panther is a long friggin’ movie), but there was John Wolf and and Co. belting out the magic at 10:30 p.m. The band is Bad Bad Men, featuring legendary punker Wolf fronting a power trio rounded out by drummer Chris Siebken and bass player Jerry Hug. Saturday night’s show was their debut, but you’d never guess judging by how tightly they played. Bad Bad Men is a natural continuation of the style of music Wolf has been playing for more than 20 years, reaching back to acts like Cellophane Ceiling and Bad Luck Charm. The only difference is in the economy of arrangements (BBM is a mean, lean fighting machine) and Wolf’s growl, which has grown into a brash, guttural bray that cuts through the band’s back-beat swing. At times BBM felt like high-energy boogie blues punk, somewhat rootsier than Bad Luck Charm’s ’90s-influenced Ameri-alt-rock sound (can you believe Viva La Sinners came out 17 years ago?). The music chugged along like a high-ballin’ locomotive powered by the Siebken/Hug rhythm section and Wolf’s blazing riffs. The band closed out its set with a brutal cover of Warsaw’s “No Love Lost” (compliments to Dr. Sheehan for pointing this out) that was the perfect capper to a perfect debut. More to come. 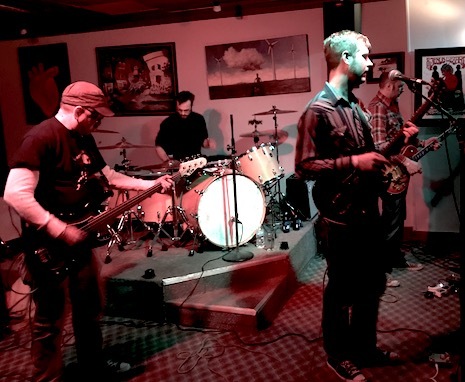 The Lupines at The Brothers Lounge Feb. 19, 2018. 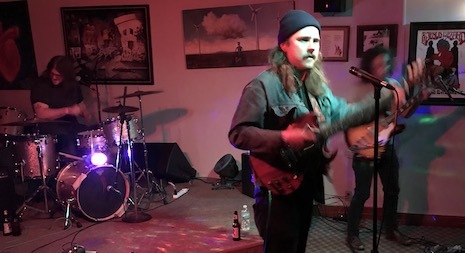 Next up was The Lupines, who played a solid set that included a few songs off their most recent collection, Mountain of Love (2017, Speed Nebraska). They closed with a long burner that I wouldn’t have minded had it gone on for 20 minutes. It was good to once again see guitarist Mike Friedman ripping alongside frontman John Ziegler and hearing his crazy leads laced throughout the songs. Those Far Out Arrows at The Brothers Feb. 17, 2018. Finally, Those Far Out Arrows hit the stage well past midnight. The band had played The Replay Lounge in Lawrence just the night before, and could be the next break-out act to grab national attention thanks to their take on garage psych-rock. If you haven’t seen these guys lately, do yourself a favor. They have a West Coast/San Francisco style reminiscent of ’90s-’00s acts like Brian Jonestown Massacre, BRMC and The Warlocks. but with a nod to bands that go back even further and farther (Them, Small Faces, etc.). Unfortunately their set got cut short when first the bass drum pedal broke and then the bass drum head broke. These things happen. You’ll get a chance to catch them again when they open for White Mystery March 4 at fabulous O’Leaver’s. Tonight Nashville band Blank Range headlines at Reverb Lounge. Rolling Stone named them one of the “10 New Country Bands You Need to Know” though I’d classify their sound as leaning more toward alt-country/Americana than straight up C&W. Think Jason Isbell or Sturgill Simpson but with less twang. Frankly, they remind me more of The Band than anyone else, and are keeping their options open by opening shows for everyone from Spoon to Drive-By Truckers to Black Joe Lewis. Evan Bartles opens tonight at 8 p.m. $10.